Tiger Airways Australia has not been put off taking on its potential future parent Virgin Australia with a decision to compete head to head between Sydney and Coffs Harbour from Feb-2013. The Singapore-owned LCC is steadily rebuilding its franchise after safety regulators grounded the carrier for six weeks in an unprecedented move in Jul-2011. Since its relaunch in Aug-2011 Tiger Australia's aim has been to build a foundation it can expand from without compromising safety processes which led to the grounding, and eventually achieve so-far elusive profitability. However, Tiger Australia’s fortunes received a major boost with the announcement in Oct-2012 that Virgin Australia would acquire 60% of the carrier, subject to regulatory approvals. While greatly levelling the playing field with Qantas – with its Jetstar LCC brand – the move could dramatically reshape the domestic network by removing a third competitor of any scale and returning the market to a duopoly between the Qantas and Virgin Australia groups. 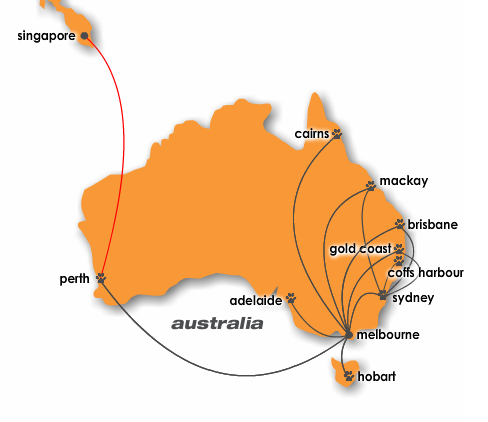 Tiger Airways has announced five new destinations in 2012 – Cairns, Adelaide, Hobart, Mackay and Coffs Harbour. Tiger Australia announced Coffs Harbour as its latest domestic destination on 25-Nov-2012 operating four times weekly from Sydney beginning in 15-Feb-2013 using A320 aircraft, providing 1,400 additional seats a week. A fifth frequency will be added on 31-March-2013 in late March adding a further 400 seats a week. Coffs Harbour, a mid-north coast tourism destination with a population of around 71,000, was not part of Tiger’s pre-grounding network and will be the airline’s only intra-state route. It could signal a step back to Tiger’s original 2007 launch strategy of flying thinner and underserved routes, having re-established itself on safer high demand Sydney-Melbourne-Brisbane routes. The arrival of the only LCC on the Coffs Harbour route competing against Virgin Australia and Qantas should result in fares reducing, at least in the short term. Tiger initially announced a launch fare of AUD59.95 (USD63) one way, but it has already cut that to AUD49.95 (USD52.5), according to its online booking system. The two incumbents are yet to respond to Tiger’s challenge. Virgin Australia has maintained its one-way lead-in fare at AUD69 (USD72.5) and Qantas' lowest fare published on its website remains unchanged at AUD75 (USD79). Qantas provides the most comprehensive schedule on the route, offering 33 weekly return services against Virgin Australia’s double daily frequency. But Qantas also operates less consumer-attractive Bombardier Dash 8 turboprop aircraft on the route compared to the mix of Embraer E190s and Boeing 737-800 jets offered by Virgin Australia. Tiger Australia’s services depart Sydney at 12.40, 50 minutes after Virgin Australia’s morning slot and an hour after Qantas’ 11.40 departure. Tiger Australia’s return leg departs Coffs Harbour at 14.20. On 17-Nov-2012 Tiger Australia also reinstated services to Mackay from Sydney and Melbourne after a 16-month absence. Its five times weekly Sydney service, adding 900 seats a week to the route, will compete with Virgin Australia as the only providers of direct services between the two centres. Qantas operates all its Sydney-Mackay services via Brisbane. Tiger Australia will be the sole provider of direct services between Melbourne and Mackay, offering 720 seats over four times weekly flights. 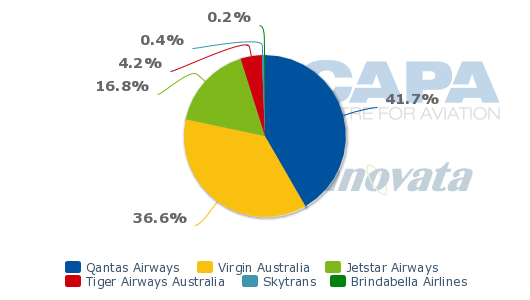 The move gives the carrier a 10.2% domestic market share by seats at Mackay. Virgin’s agreement to acquire a controlling stake in Tiger Australia from Tiger Airways is part of a three pronged deal announced on 30-Oct-2012. The deal also included Virgin Australia buying all of Western Australian regional carrier Skywest Airlines. To fund the two acquisitions Virgin Australia was able to apply the funds from Singapore Airlines taking a 10% stake in the Australian carrier through the issues of new shares to it. ACCC chairman Rod Sims stated at the time of Virgin Australia’s application to acquire a controlling stake in Tiger Australia that it would have to convince the commission that returning the Australian domestic market to a duopoly dominated by Virgin Australia and Qantas will be in the best interests of consumers. “Yes they will be stronger to compete with Qantas, that’s a plus, but they’ll take out the remaining competitor to do it, that’s the negative,” Mr Sims said. Mr Sims need look no further than the effects of Tiger’s grounding for an insight into how a duopoly could result in pricing behaviour at the expense of air travellers. The impact on pricing was demonstrably illustrated in the six months following the carrier’s grounding which was immediately met with a spike in air fares over the following six months as rivals sought to rebuild yields. This however occurred as Virgin was shifting its emphasis to becoming a full service operation. Without the diversity offered by the dual brand approach that the Qantas-Jetstar group possesses, Virgin was in no position to compete at this lower end of the market. Australia’s Bureau of Infrastructure, Transport and Regional Economics data showed the best discount economy fare index moved from 62.9 in Jun-2011 to a peak of 92.8 in Dec-2011, a four-year high, even allowing for the typical increases experienced in the lead up to Christmas. The increases wiped out the pricing impact Tiger brought to the market when it entered in late 2007. Even on a 13-month moving average, fares reached a three year high over the six month period. Fares fell back to Jun-2011 levels in Jan-2012 and have traded around that mark for much of the year, prompting Qantas domestic CEO Lyell Strambi to lament in Nov-2012 that: "There's a lot of capacity sloshing round the Australian marketplace overall... Ultimately the winners are the customers". While Virgin Australia has made it clear that Tiger would continue to operate as a stand-alone entity (and it would still be 40% owned by the Singapore group), the two carriers will find ways to remove – or coordinate – duplication of services and frequencies to the group’s benefit. Notably, since Jetstar's original entry into the domestic market, it has increasingly entered city pair routes operated by the premium brand; Group CEO Alan Joyce has said that this was acceptable as it responded to demand from different market segments. There are many layers to the implications of the proposed acquisition though. One relates to the importance of operating high frequency service on the vital Sydney-Melbourne route, where constrained peak time slot access at Sydney Airport has proven a major advantage for the Qantas Group. Of the 10 daily services Tiger operates between Sydney and Melbourne, nine depart within 15 minutes of Virgin Australia services, which operates 28 services on the route. Between Sydney and Brisbane three of Tiger’s four frequencies are timed within 15 minutes of Virgin Australian departures out of a total of 17. 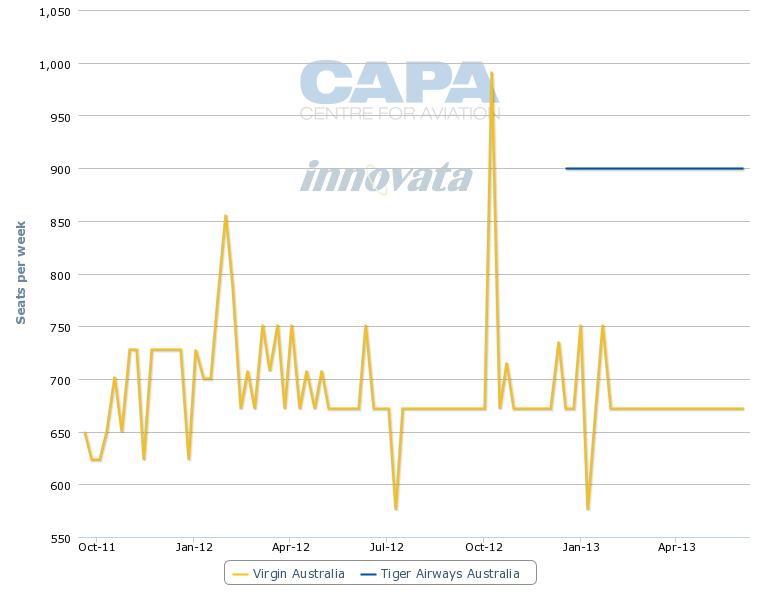 Tiger Australia currently offers just under 5% of Australian capacity, according to Innovata data, with two thirds of it on the Sydney-Melbourne-Brisbane triangle and Coolangatta, but if aggressive growth plans are implemented under Virgin Australia ownership, its market share could increase to 15%. 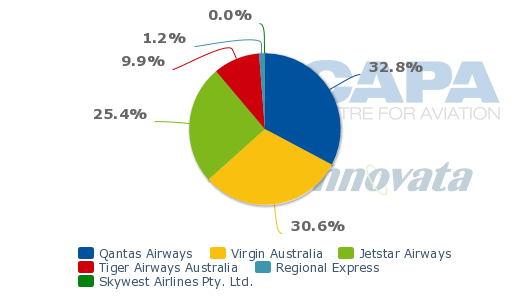 While that is still short of Jetstar’s current 21.7% and growing share, it will also significantly boost the overall market share for Virgin Australia as a group, currently just under 29%, against the combined 61.7% held by Qantas/Jetstar. The transactions would allow Virgin Australia to compete more comprehensively with Qantas domestically and breathe new life into Tiger Australia, which has been unprofitable since it was established in 2007 and particularly since the 2011 grounding. For Virgin Australia, Tiger Australia would provide it with a vehicle to re-enter and compete again in the budget sector of the market, which it exited as it evolved from its previous identity Virgin Blue, and moved upmarket in attempts to compete with Qantas for higher yielding traffic, particularly the business market. Tiger Airways and Virgin Australia have also committed to investing up to a further AUD62.5 million (USD64.6 million) into the business to fund growth in Tiger Australia, with the joint venture aiming to more than triple Tiger Australia’s current fleet of 11 A320 to 35 A320s within five years. Qantas has long dominated the Australian domestic market. Currently Virgin Australia’s 431,368 seats give it a 28% market share, while Tiger Australia accounts for just under 5% with 75,240 seats. 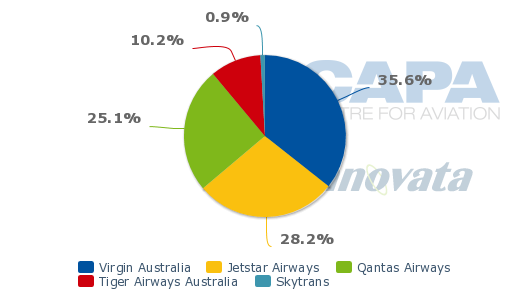 Jetstar has nearly 22% and Qantas 40%. Tiger Australia carried 239,000 passengers in Nov-2012 having already surpassed the pre-grounding level of 212,000. 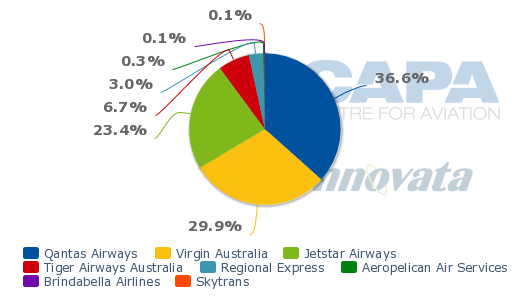 The airline has its largest share of the market at Melbourne with 9.9% compared to 6.7% at Sydney. It falls below its market average share in Brisbane with 4.2% and just 2.2% in the Qantas stronghold of Perth. Qantas’ main brand offers the most extensive domestic network boasting 62 destinations, while Virgin Australian comes in a relatively distant second with 42. Jetstar and Tiger offer 20 and nine destinations respectively, predominantly focused on Australia’s eastern seaboard. Tiger and Jetstar have roughly matched each other’s capacity growth between Sydney and Melbourne until the end of Oct-2012 when Tiger pulled back from 13,860 one-way seats a week to 11,340 in the week of 17-Dec-2012 to 23-Dec-2012. 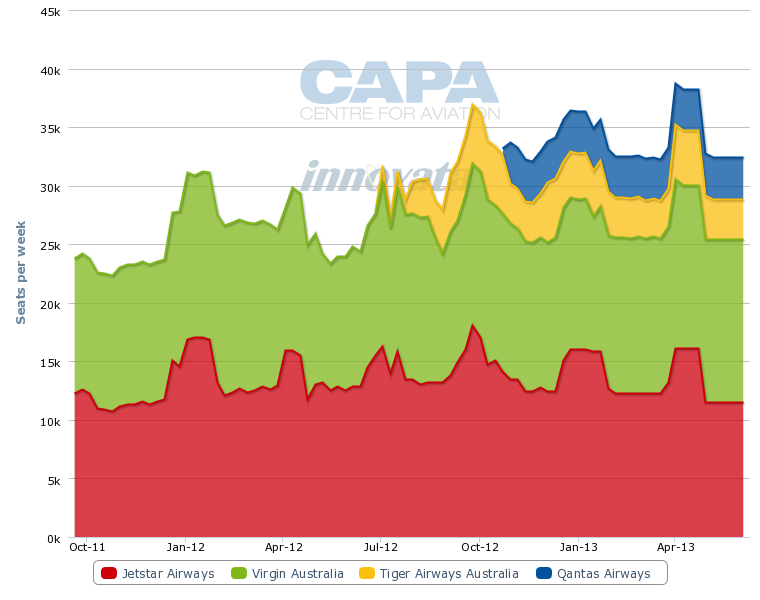 Fares between Sydney-Brisbane and Sydney-Gold Coast had been climbing until Tiger's return, a trend now reversed. The LCC has added 4,860 one way seats on the Sydney-Brisbane route since resuming services on the sector on 01-Aug-2012, growing capacity on the route by 8.7% to a total of 55,677 seats. Jetstar operates 5,500 seats on the route. Tiger’s return on Sydney-Gold Coast on 01-Jul-2012, adding 3,960 seats was matched by Qantas in Oct-2012 with 3,528 seats in the 17-Dec-2012 to 23-Dec-2012 week taking the market to a total of 35,626 a week. 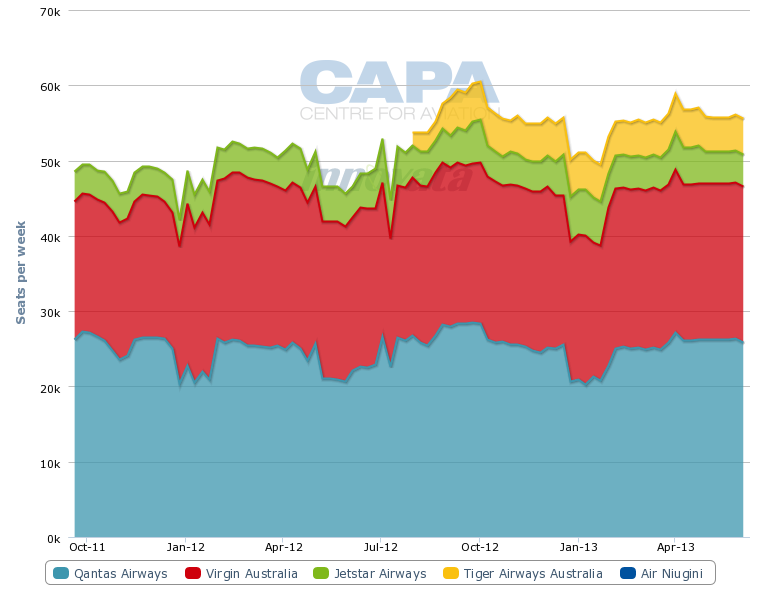 While Virgin Australia’s proposed acquisition of Tiger Australia will immediately increase the group’s market share by almost 5%, the effect is more pronounced as a share of capacity at the key Sydney and Melbourne gateways. At Sydney, Tiger Australia will add its 6.7% capacity share to Virgin Australia’s domestic market share of 29.9%, helping to close the combined 60% held by Qantas/Jetstar, of which Qantas has 36.6%. 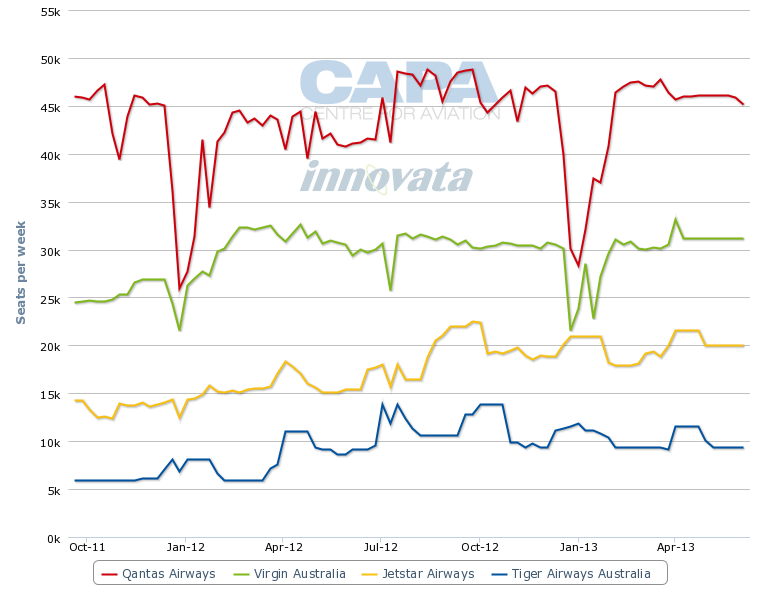 At Melbourne, a Virgin and Tiger capacity share would rise to 40.5% against Qantas/Jetstar’s 58.2%. A similar result is achieved at Brisbane. Tiger has steadily rebuilt its network to nine destinations with the resumption of Mackay on 17-Dec-2012 from Sydney and Melbourne. It will add Coffs Harbour as its 10th point in Feb-2013. The Mackay services will be operated by an additional A320 which arrived on 15-Dec-2012, taking Tiger's fleet to 12, two more than it had at the time of the grounding. Immediately before its grounding on 01-Jul-2011 the airline operated to 14 points, including both Melbourne's Tullamarine and Avalon. A number of routes previously operated are yet to be reinstated including Alice Springs, Rockhampton, Sunshine Coast and Canberra. As Tiger Australia continues to reestablish itself it will inevitably come into greater contact with proposed suitor Virgin Australia. Virgin Australia meanwhile has recognised that it needs to re-enter the LCC market or risk facing the same challenge that it brought to the market in its previous incarnation. The really intriguing story will be how Virgin Australia adjusts the group’s network to cope with what will essentially be a duplication of the Qantas/Jetstar dual model strategy – and therefore, presumably, a more complete bilateral competitiveness across the network. Whether that will be more valuable overall to the market than having a third substantial force on trunk routes is something the competition regulator will have to digest. Against the background of a faltering domestic economy with its softening demand, and massive upheavals going on in both Virgin Australia's and Qantas' international operations, it will require brave calls to stand in the way of what appear to be sensible market adjustments.